The 24 Hours of LeMons is visiting Barber Motorsports Park (previewed here) this weekend and without belabouring the point too much, I've enjoyed what has been a terrific three-way battle for the overall race lead during Saturday's 7-1/2 hours. To make matters more interesting, the Class B standings shuffled up several times, too, and there should be a proper race in that class, as well, for Sunday's seven hours, which will be split into two sessions. Before we go into the nitty gritty of Saturday's racing, here's where things get interesting for Sunday's race: The racing is in two sessions with two hours in the morning and five hours in the afternoon, split with a one-hour quiet time. Why is that intriguing? This means that any car that can run 2-1/2 hours between driver changes can run the entire day with only one driver stop. Further, any car that cannot go more than two hours will have to make three in-race stops. Since a driver stop costs the average team probably 4-5 minutes and an average lap is around two minutes, that could be very costly. With that in mind, let's look at how the day finished up in the classes and then we'll look at some basic analysis. This has been a terrific race, all told, with three clear-cut frontrunners who all led the race at various times and will start Sunday nose-to-tail on the same lap. Curiously enough, Road Warrior's E30 only led four laps today: a single lap before pitting mid-afternoon and the day's final three laps. For any of the rest of the Top 10 to win, there will have to be some titanic failures from the trio. It's worth noting that the trifecta at the front have all displayed almost the exact same stint capability. With an average lap probably around 2:05 or quicker and the magic stint length capability around 2-1/2 hours, that means that any of the Top 10 teams would probably need to run 72-73 laps to have a one-stop day. As you can see, all three are close to that but probably going to come up 5-10 minutes short. That may very well leave all three on equal footing, needing two fuel stops in the five-hour afternoon session Sunday. All else being equal, the Save the Ta-Tas Camaro is faster than the E30s; if it can keep from breaking, it should theoretically win, but that's far from certain. The Squrtin' Coronas Merc presents a bit of a wild card: They seem closest to meeting that magic stint length number, but the gap to the front three may be insurmountable. If it weren't for a black flag or a small mechanical issue causing them an additional stop, things would be a bit more interesting. Of the remaining Top 10 cars, the GRM Miata and the Team Dickbutt Mercedes may need a stop in the two-hour morning session, which could cost them. The Class B race is far from settled and the fuel stint intrigue could turn what looks on its face like a two-car battle into another triumvirate. After Speedycop led early in the famed Honda Accord-ion, the lead transitioned to the Generar Ree Datsun when the Honda suffered mechanical setbacks. The Generar Ree led the class probably 60 percent of the day, but a black flag down the final stretch run allowed the hard-charging Knoxvegas Lowballers to slip. A hard final hour of driving by the Lowballers' closer for the day put the Datsun down a lap to start Sunday's driving. 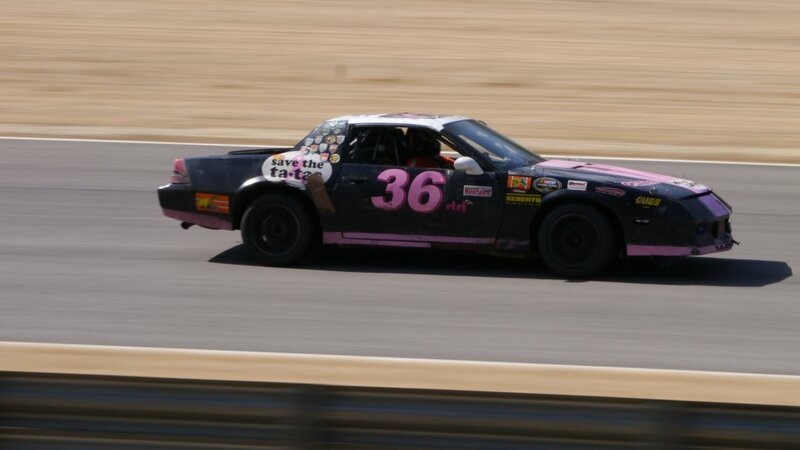 Interestingly enough, the Lowballers other two cars, a Duratec V6-swapped Geo Metro and a Mazda MPV with two Duratec V6s and some crapcan-caliber linkage for both engines' manual transmissions, blew the hell up in the opening half hour of the race. The class leaders both had enough setbacks to merit an extra stop or two. The Lowballers might be marginal on fuel during the two-hour morning session while the Generar Ree should have it covered. A quick stop for the Contour may cost them they lead, but they also are a little quicker on average and could cover the distance. More interesting is the PBR Subaru. It was the only car that ran the day with only two stops, something they've done before. Their stints were all almost identical: 66, 66, and 67 laps each. This smacks of a team that knows how to perform consistently and has it all together. With average lap times a little slower in Class B, the magic number is probably closer to 68-70 laps to make that 2-1/2 hour stint. Making up four laps will be tough with all else equal, but a single mistake by the two cars ahead could be the difference. The Class B winners are often decided by who makes the fewest mistakes, but you can never count anyone out who is within a shout of the class lead. The Duff Beer Civic could be in with a shout and some luck. Class C at this race, like most LeMons races, is a matter of which car has kept from breaking. It's not really worth it to examine the strategy too closely; the winner at this race will be the team who keeps their car in the fewest pieces. Morrows' Pontiac Six-powered Banshee has run like clockwork and even clocked a reasonably fast 2:06 lap. The average lap has been considerably slower because in Class C, there's simply no reason to push a car very hard. A 33-lap lead equates to probably around 90 minutes in this class so the race is Morrows' to lose. Should they stumble, this suddenly becomes a slow-and-steady race between the 3PM Datsun pickup and the Idle Clatter diesel Mercedes.